Derrick Rose may not have had a big game statistically speaking when the USA National Team took on France in an exhibition game Sunday afternoon at Madison Square Garden, but it didn’t bother him in the least. “I feel good about how we played and we got the win. 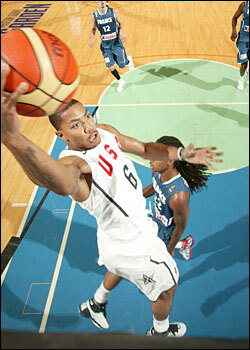 That’s the biggest thing,” said Rose of USA’s 86-55 victory, in which he recorded two points, three assists and three rebounds in 15 minutes of play. The game started slowly, though, for both teams, as through one period, it was tied at 16-16. Krzyzewski, who said he was pleased with his team’s defense and effort, opted for a starting lineup that consisted of Rajon Rondo, Chauncey Billups, Andre Iguodala, Kevin Durant and Tyson Chandler. Hence, Rose came off the bench, but again, he’s taking no issue with that whatsoever. Rose’s attitude seems to reflect a team-wide state of mind as players begin to learn their respective roles now that exhibition games are finally underway after several weeks of training. Still, Coach K talked on Saturday following a scrimmage against China about the need for players to exude some swagger. He saw just that for the final three quarters on Sunday, as the Americans outscored France 70-39 during that stretch and made several highlight dunks that fired up the capacity crowd of 19, 763. “This group is really a good group,” Krzyzewski said of the 13 finalists, which include five 21 year olds and two 22 year olds. “Intangible-wise, it’s off the charts with attitude, team and hard work. That’s a good place to start. Now, let’s get them back to what they do with the Bulls, Sixers, Clippers or whatever team they play on. Prior to Sunday’s game, USA Basketball announced that the roster had been reduced to 13 finalists, with Jeff Green of the Oklahoma City Thunder and JaVale McGee of the Washington Wizards not moving on. That leaves just one more cut to determine the final 12. When asked if the players had any indication on who will be among that group, Rose said he’s just as in the dark as everyone else. As for what Krzyzewski would like to see out of Rose as the team heads to Madrid, Spain for four more days training and two more exhibition games against Lithuania on Aug. 21 and Spain on Aug. 22, he just wants continued improvement. The official USA roster that will compete in the 2010 FIBA World Championship, which will be played Aug. 28-Sept. 12 in Turkey, must be submitted to FIBA at the technical meeting that normally is held the day prior to the start of the competition.